Long a proponent of clean, functional and purpose-driven network sites, I have been a devoted user of the likes of Flickr, Facebook, Resident Advisor and Last.fm. For artistic purposes in recent times, the Bēhance Network has been a good one for portfolio display and creative inspiration. But despite it housing some extremely impressive and awe-inspiring talent, it has always seemed to me to be a bit on par with ASmallWorld: an exclusive, professional online community platform with a corporate finish that’s a bit unfriendly, visually hard-edged and beyond what I would like to use it for at this stage of my graphic design endeavours. 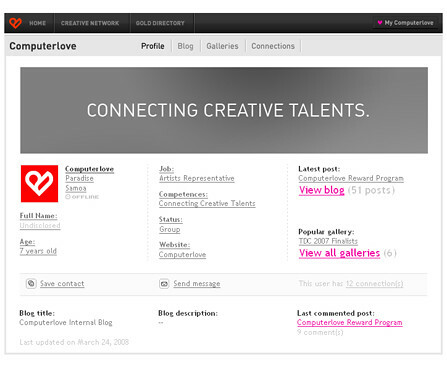 But in having come across Computerlove™, I have found the answer to my portfolio-displaying needs, as this online creative network has an interface that the Ludicorp crew can only dream about. Perhaps it’s the emphasis on its straightforward blog-style layout (somewhere in between WordPress and Typophile in presentation) or the seamless gallery display that makes its use very appealing. But ultimately, it has an element of je ne sais quoi about it that inevitably leads to its debut in my Bookmarks Toolbar Folder.